The load-bearing face of an Ashley's stopper knot. 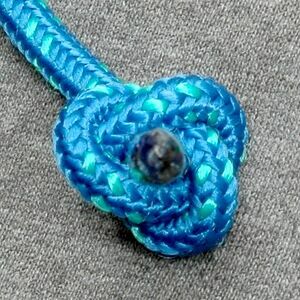 This particular example was tied in an unusual manner, with the "standing part" very short, to fully expose the knot's Trefoil-like face. Ashley's stopper knot, also known as the Oysterman's stopper, is a knot developed by Clifford W. Ashley around 1910. It makes a well-balanced trefoil-faced stopper at the end of the rope, giving greater resistance to pulling through an opening than other common stoppers. Essentially, the knot is a common Overhand noose, but with the end of the rope passing through the noose eye, which closes upon it. Ashley developed this knot in trying to duplicate a knot he saw on a boat in a local oyster fishing fleet. When he had a chance to observe the knot up close at a later time he realized it was just a badly water-swollen figure eight stopper knot. Form an Overhand noose, or simply tie an overhand knot around the standing part as shown. Tighten the overhand portion of the knot around the standing part. Thread the working part through the loop. Budworth, Geoffrey (2001). The Ultimate Encyclopedia of Knots & Ropework. Anness Publishing LTD. ISBN 1-84309-146-1. Ashley, Clifford W. (1944). The Ashley Book of Knots. Doubleday & Company. ISBN 0-385-04025-3. This page was last edited on 27 December 2009, at 14:11.